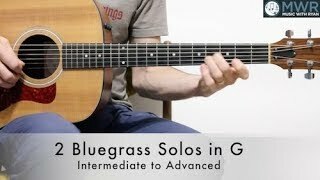 This week's featured lesson we'll be taking a look at an original composition I've entitled '2 Bluegrass Solos in G.' I'll be using a chord progression that is commonly used in Bluegrass music. I've created two solos that sit in the intermediate to ad advanced level. We'll be using lots of hammer-on's, pull-off's, slides, and consecutive eighth notes to help add a lot of drive to your solo. I'll also be throwing in a few Tony Rice licks as well! Go ahead and give it a listen and start learning some classic Bluegrass guitar moves!